The Landini 5D Series tractor is a simple mechanical stockman tractor with the ability to handle tougher field jobs. 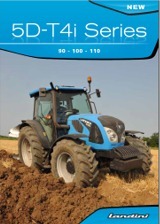 The Landini 5D Series offers 3 models in 2WD or 4WD covering the 85 to 102 hp bracket. Moving about small farmyards is a breeze with a steering angle of a tight 55⁰ and a low cab height which allows for easy access to low buildings. With a new hydraulic circuit system providing up to 82 litres per min of flow through four auxiliary spool valves, controlled with ease by lever controls, integrated in the right-hand console of the cab. The 5D tractors have a mechanical transmission with synchro shuttle lever under the steering wheel that provides four speeds in three ranges, offering 12 forward and 12 reverse gears, and can be combined with an overdrive and a creeper. Besides new more-efficient engines, the 5D range also has a brand new look. The hood has been fully redesigned to reflect the new Landini family styling and the cab interior has been refreshed to offer the operator higher levels of ergonomics and comfort. Fitted with Perkins 854E-E34TA 3.4L, four-cylinder engine. All 3 models are Turbo after-cooled.